I’m a fourth generation Bernick and a lot of hard work and great people have gone before us to get us to this point. I feel privileged to continue that legacy. One of the most important things for me is to ensure the fifth generation has the same opportunities I do. Reflecting upon and celebrating our 100th year in business is a great way to re-emphasize what has always been so important to our culture. Our 100 Years, 100 Grand giving initiative was about looking for an idea that was bigger than us. Something that tied into our anniversary, yes – but we wanted to pay homage to our heritage by giving back to our communities. It’s because of these communities and their support that we’re celebrating this milestone. We wanted this idea to be about those people and places. So, we collaborated as a team and came up with the idea of 100 Years, 100 Grand. This summer, as part of our milestone anniversary, we launched the Bernick’s 100 Years, 100 Grand Giving Initiative. Through this initiative, we partnered with 100 of our customers - across Minnesota and western Wisconsin - who each donated $500 to their favorite local charity or non-profit organization. Bernick’s matched each of these 100 donations. Together we were able to contribute $100,000 to the charities in the communities in which we live and work. Thank you so much to the Bernick’s customers who participated! The response has been overwhelming both internally and externally. 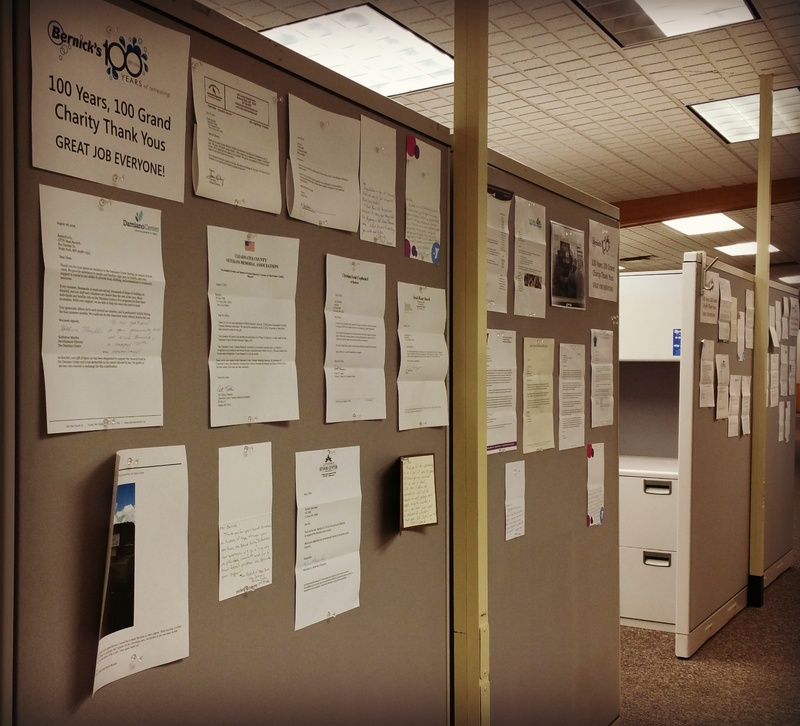 We’ve created a “Wall of Thanks” in our office that showcases the notes and words recipients have shared with us. It was important to share the success of this initiative with our team, so they too could see the effect our customers have not only on what we do here, but in the communities they serve. We placed a map on the wall to physically represent the impact this initiative has had, and it’s incredible to see the reach extend all over Minnesota and Wisconsin. The difference our customers have made in the lives of their nominated charities! There has been elation and there has been endless surprise. That’s what was unique about this giving initiative; the charities and organizations didn’t know this was coming. The first inkling for many of the recipients was the “greetings and congratulations” letter I sent to each on behalf of the nominating customer. That was the impact we hoped for, and we are still so excited with the outcome and response. This is the biggest thing we’ve done at Bernick’s so far. The Willmar Area Food Shelf – helps those in need put food on their tables. Life House – attempts to help teenagers get off the street to collect themselves and make a fresh start. Douglas County Car Care Program – gives families in need of reliable transportation cars or needed repairs so they can work and care for their families. Bootstrap Comrades – collects funds to buy essentials for homeless veterans, including care items like toothbrushes, hygiene items, socks, water bottles, and giftcards for meals. Pockets of Hope – gives foster children in Central Minnesota new backpacks filled with items they can call their own as they face transition. Damiano Center – responds to the needs of Duluth’s low-income, unemployed, and in-need people. Innovation is critical for our future. We’ll always try to reinvent ourselves to ensure we can react to our consumers and their behaviors, while simultaneously educating our customers on the industry. I’ll tell anyone who will listen – things change more in one year than they used to in 10. Whether it’s the rate of change, consumers, suppliers, or employees - change is inevitable. Reacting to the things that happen around us, and in our communities, is part of our charge, too. My hope for the fifth generation is for them to proactively deal with the inevitable change ahead, while honoring Bernick’s heritage. That means taking care of our customers and our people. Thank you. To all of you. For being part of our community and helping us support so many deserving organizations and causes. Thank you for your loyalty and partnership – we are proud to serve you. Be sure to check out our full-page ad in the St. 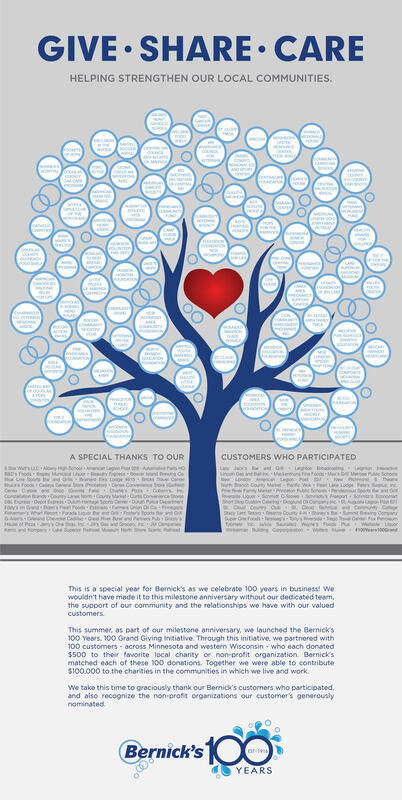 Cloud Times Sunday, September 4th as we recognize our Bernick’s customers and the non-profits they generously nominated as part of our 100 Years, 100 Grand giving initiative.